Free time is no longer prayer time for Christian students at Pine Creek High School, Colorado Springs after they were banned from meeting to pray, sing religious songs, or discuss religious topics as a group. Chase Windebank a senior at Pine Creek was summoned to the office of the Assistant Principal James Lucas because he had been leading a bible study group in their school, Fox News reported. Tedesco is with the Alliance Defending Freedom, a law firm specializing in handling religious liberty cases and the group that successfully pushed an Arizona school district to tamp down its sexual education curriculum. A school spokesperson confirmed that the Windebank group was told to disband in accordance with state law. In my view, governments do not have the right to tell people that they cannot pray or speak of religion along as it is not being done in a disrupting way. 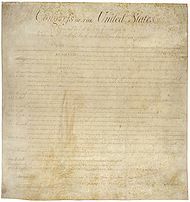 The intent of the bill of rights was that no governmental entity in the USA could restrict freedom of speech or religion as these were considered to be inalienable human rights. Now, more and more government officials are attempting to abridge the free exercise of various rights supposedly enshrined in what has been called the Bill of Rights. Many government official do not truly abide by the Constitution of the USA any more. The USA is in decline in many ways. It is not truly the land of the free anymore. This entry was posted on Thursday, November 13th, 2014 at 4:00 pm	and is filed under Religious News.